V-Mount (Sony) compatible battery chargers, available in portable or rackmount types. The first battery systems that allows batteries to be charged whilst linked, allowing four or sixteen batteries to be charged at once, depending on model. 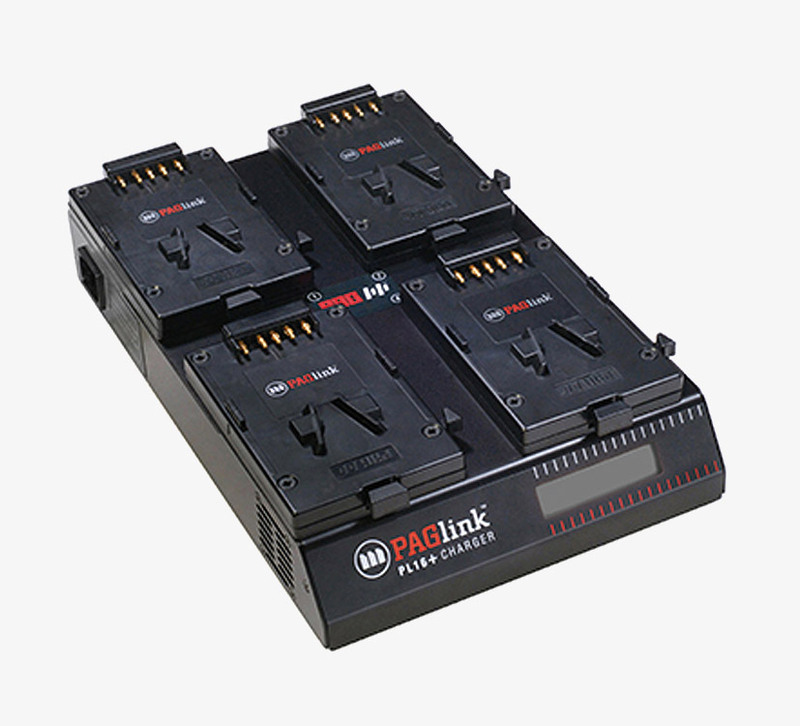 The PAGlink intelligent batteries control their own charging, with the most discharged batteries given priority. The charge status of each battery is shown on its individual display, and fully charged batteries will automatically stop receiving charge independently. All designed and manufactured in the UK. 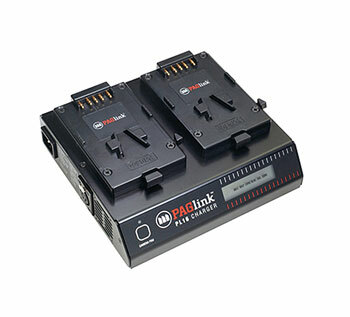 This ultra-compact charger can simultaneously charge four PAGlink V-mount batteries, or one non-linking V-mount battery. Fully-discharged 96Wh batteries will take four hours each to fully-charge. 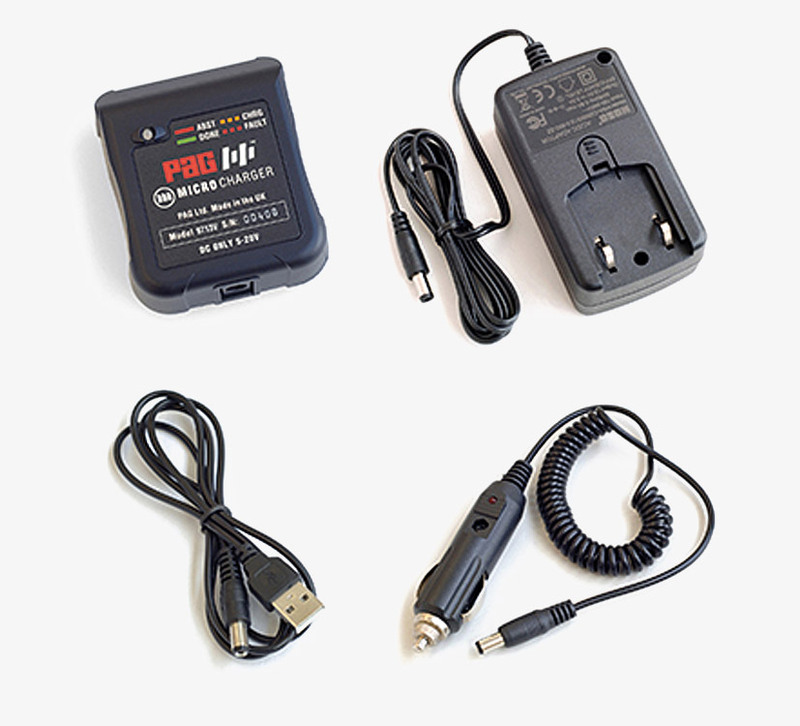 The charger accepts 5-20V DC input, and can be powered from a variety of sources, such as worldwide AC to DC power supplies, a 12V vehicle battery and a USB charger. The accessories to achieve this are included, making the Micro Charger the 'ideal broadcast battery travel charging kit'. Note: The AC to DC adaptor will be supplied with an interchangeable UK plug. 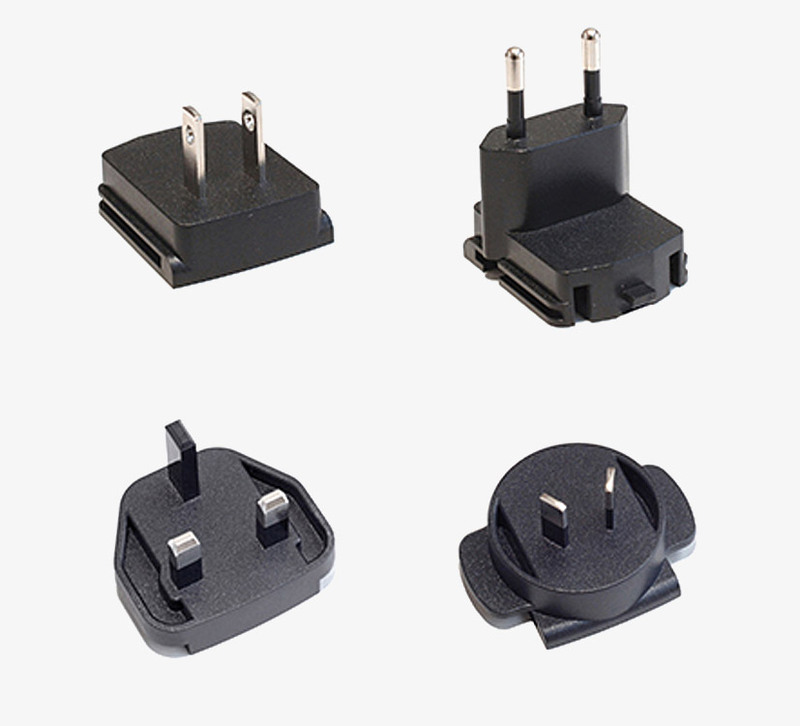 Plugs for Europe, Japan/US and Australia can be ordered seperately in this section. A two-position V-mount Li-Ion charger, capable of simultaneously charging up to sixteen PAGlink batteries, eight linked on each position, or two non-linking V-Mount batteries, one per position. The PL16 also incorporates a 100W camera power supply with XLR4 output. This function is operated by holding down the Camera PSU button on the chargers front panel. Charging is suspended whilst the power supply is in use. Power input: 100-240V AC, 50/60Hz, 220W. A four-position V-mount Li-Ion charger, capable of simultaneously charging up to sixteen PAGlink batteries, four linked on each position, or four non-linking V-mount batteries, one per position. Power input: 100-240V AC, 50/60Hz, 220W. Note (1): Charge times are for fully-discharged 96Wh batteries to fully-charged. Times will be less if batteries are not fully-discharged. 150Wh batteries will take 50% longer. 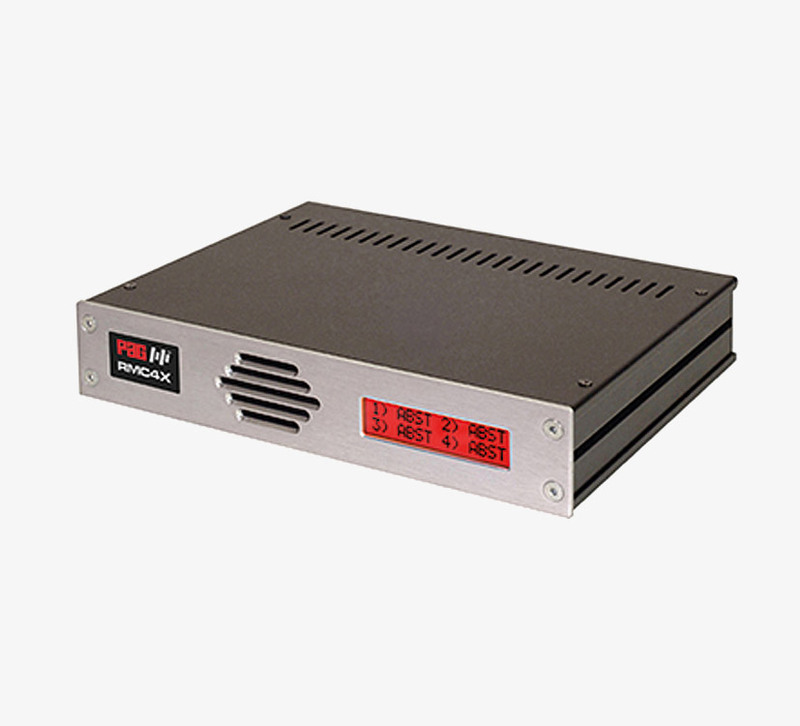 A rack-mountable, high-power, simultaneous broadcast battery charger, designed for use in outside brodcast vehicles. Designed to be mounted in a half-width racking system, and measuring 1U high. 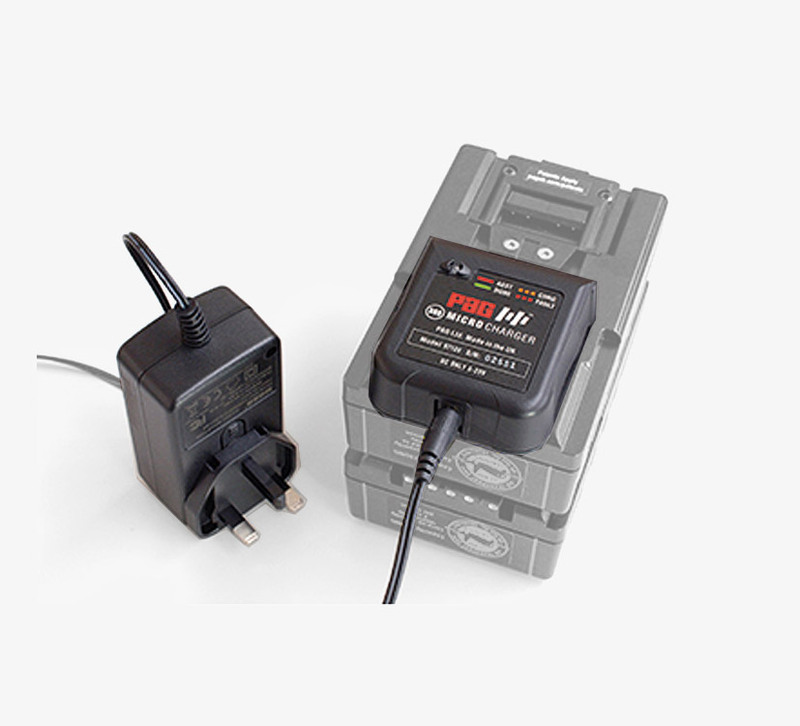 This charger is equally suitable for use in a workshop environment. Used to simultaneously fast-charge V-mount batteries (Li-Ion and NiMH) manufactured by PAG and Sony, via four battery mount plates. The battery mount plates have a captive one metre cable, terminated with an XLR4M connector. The charger's XLR4F connections are situated on its rear panel. A comprehensive liquid crystal display shows the status of the battery and charger. The charger is fully automatic in operation an no user controls are provided.